Red Player at the Top of the Triangle serves the ball with her hands to the Blue Player. The Blue Player plays the ball back to the Red Player and moves to the the next area of the triangle.Once the Blue Players reaches #3 they move back the opposite way. Coach Chooses the way the ball is played back. Instep Volley with Right Only, Laces Volley with the Right Only, etc. Each Round lasts for 1 minute before the switching players . MOVEMENT is key as the you want the player moving at game speed. THE SESSION:Small cones 10yds apart, flat discs 6 yds apart. Players start at flat discs. Ball is passed between partners. 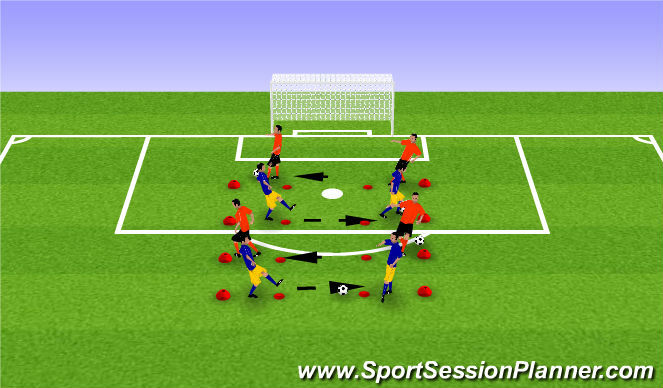 Player receiving ball makes a turn designated by coach, dribbles around cone and returns to flat before passing back to partner who then repeats the process around their cone. PROGRESSIONS: Expand space between cones. 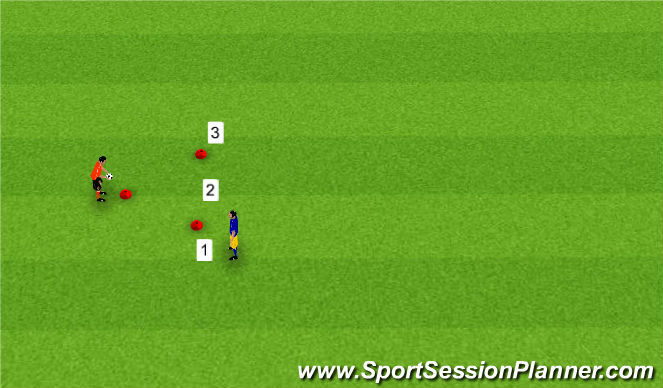 Challenge squad by using a timer to see how many passes can be completed in an allotted window. KEY MESSAGES/POINTS:Ready, atheletic positions. Proper passing technique and weight. Use different turns with proper touches when dribbling around the cone. Area set up as shown, can be adjusted for different age groups with 3 teams of approx. 5 in each. - Teams send 1 defender to the next square (clockwise). - Play starts with the attacking team getting a ball from outside and playing it in. This should create 4 v 1 in each square. - Each attacking team aim to complete 5 passes without the defender touching the ball (1 point for each 5 completed passes). - Keep track of scores. - Be proactive and if "ball moves, you move". - "Circulate ball" in your area and make sure you "find the line". - "Open to recieve" and "back foot" when in possesion. - If a defender touches the ball 3 times they can then help the next square defender for a bonus point. e.g. Red defender would move into next square to help green defender. - Attacking team 1 point awarded for completing 5 passes. - Defenders get 1 point for touching the ball 3 times. - The team with the least points are "on the line"!!! 10X10 to start. adjust as needed. Coaching points: Possession demands you to be always on the move, and always communicating. No communication equals a player with two balls. - don&apos;t invite the pressure. Waiting until you are pressed is too long. Your greatest advantage is numerical supiority. Allowing a defender to collapse on you isolates you and plays into their hand. Make them always chase the game. 50x30 yd area split into 2 25x30. 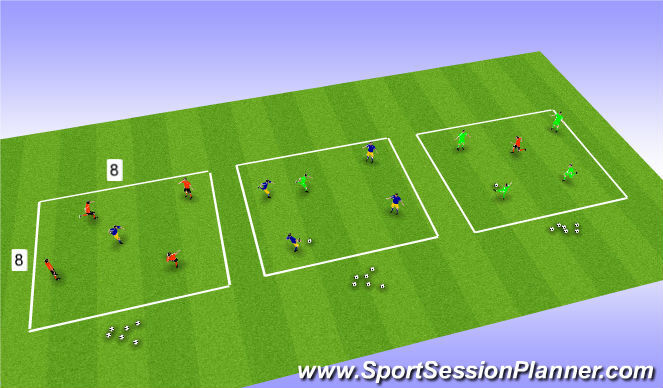 4v4 begins in one area with 4 players on the outside. The 2 players on the endlines stay on the ends but the players on the side have to support the ball when it is in either box. The team in possession can use the 3 outside players to keep possession. If the defending team wins the ball they must get it to the player on the opposite end and transition to keep possession. -Competitive 1 point for winning the ball. 5 for winning the ball and getting to the player on the endline. 10 for winning the ball, getting to the endline player and then being able to keep possession for 3 passes. coaches at either side touch line with balls. 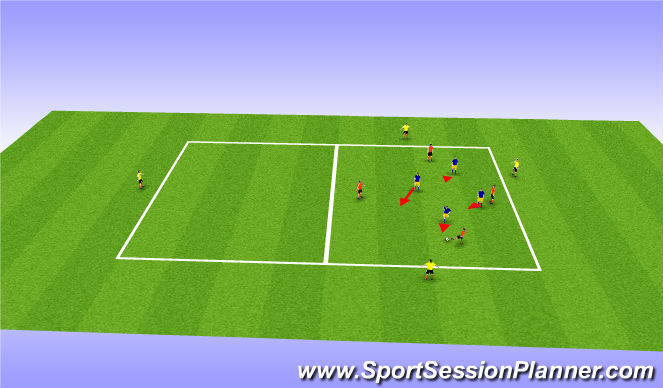 2. defenders must sprint around 2nd cone before defending 3v2. 3. Attackers look for point with goal, defenders look for point by gaining possession and playing to either coach.